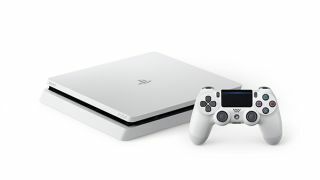 We’ve already had a white version of the original PS4, and now someone has spotted a 'Glacier White' version of the company’s newer PS4 Slim. The spot originally came courtesy of NeoGaf user ‘crinale’, who spotted the listing on Sony’s Japanese site. Sony later confirmed the existence of the console on the official PlayStation Blog. A Google translation of the page reveals that the new color is currently due to come to Japan, Asia and Europe, and will be priced at £259 in the UK with a 500GB hard drive. European gamers will apparently get hands on first with a January 24 release date, while Japanese players will get it on February 23. So far there's no word on a US release. As well as a white chassis, the new console also comes with a new white DualShock 4 controller, which appears to feature the updated lightbar seen on the PS4 Slim and PS4 Pro’s controller. No mention is made of an American or Australian release unfortunately, but we’d be surprised if it doesn’t eventually make it to those territories. Sony has also released a trailer for the new console, which you can see below. Check out our guide to the best PS4 games.